New report is the first to include voluntary recall data, providing a glimpse of the enormity of the recall crisis. For the first time in history, data reveals the vehicle recall crisis is even bigger than anyone thought. 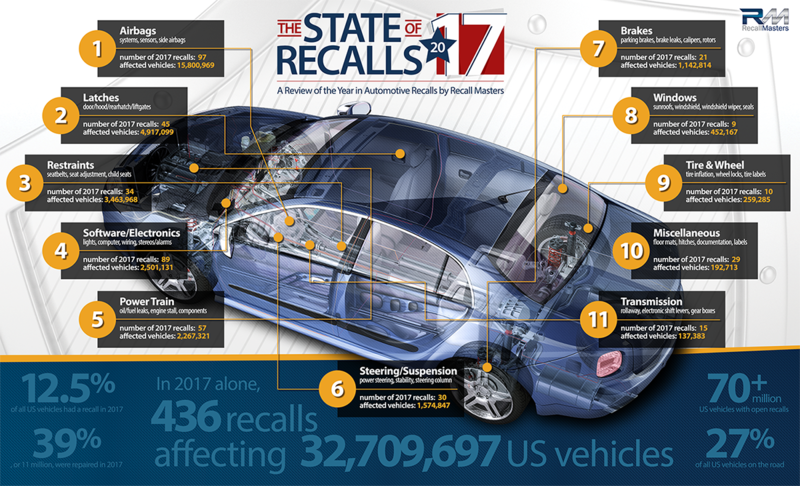 In its first “State of Recalls” report, Recall Masters, the automotive industry’s leading provider of recall solutions, found more than 32.5 million vehicles (12.5% of all vehicles on US roadways) had a recall issued in 2017. The vast majority of those recalls pose a specific risk of death or dismemberment. Automakers were able to repair some 11 million (39%) of those vehicles by the end of 2017. However, because of a backlog of un-repaired vehicles from prior years, there are still more than 70 million vehicles (27% of all vehicles) with open recalls across the United States; that’s over 1 out every 4 vehicles with an open safety recall. This is the first report to disclose not only NHTSA mandated recalls, but also voluntary recalls initiated by the manufacturers. While the numbers for 2017 break a streak of historic highs on mandatory recalls, the findings in the Recall Masters “State of Recalls” report are proof that most safety recalls are not being addressed properly, leaving millions of drivers in danger. Recall Masters President, Chris Miller says, “This is unacceptable. Consumers need to know the risk they are facing before they purchase or even get in a vehicle. It’s about safety, transparency, and doing what’s right.” Miller says fixing this problem requires better technology, better communication, consumer participation, and coordination between automakers, local dealerships, vehicle owners, and the federal government. The nature of the defects spans a wide range of categories. For the fifth consecutive year, airbag recalls dominated the field as the most common safety defect resulting in a recall. With door, hood, and rear latches, occupant restraints, drive trains, and software/electronics rounding out the top five. Software/electronics have steadily risen in frequency as a major cause of recalls over the last decade, and, as we move into the era of high autonomous vehicles and connected cars, are predicted to be the most common cause for vehicle recalls in the next decade. Currently, there is no federal law that requires a car dealer to fix an open recall before selling a vehicle to an unsuspecting consumer. There is also no requirement under federal law that a dealer or other service center notify a vehicle owner of an open recall when a vehicle is in for maintenance, repairs or even an oil change. It is not clear if every auto dealer provides adequate notice to consumers when they sell a vehicle with an open safety recall. Getting unsafe vehicles off the road is critical to improving safety and saving lives. Automobile manufacturer defects resulting in accidents are responsible for 400 deaths and 25,400 injuries annually. The combined economic impact of these incidents total over $2.2 billion each and every year. Recall Check can be accessed on the web at http://www.motorsafety.org/ and the Recall Check mobile app can be downloaded from both Apple’s App Store and Google’s Play Store. 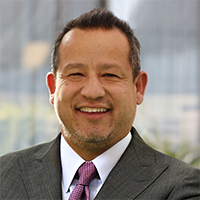 Sean Reyes is the Chief Marketing Officer for Recall Masters. If you would like to receive “The State of Recalls 2017” report in its entirety, please complete and submit the contact form on this page. Media inquiries can also be submitted using the form. Please share with us how you plan to use the information so that we may provide you with supporting images, quotes or data. Thank you for your inquiry.